When you have created a purchase, it will be best if you will get your sales receipt from the business that you have transacted with. 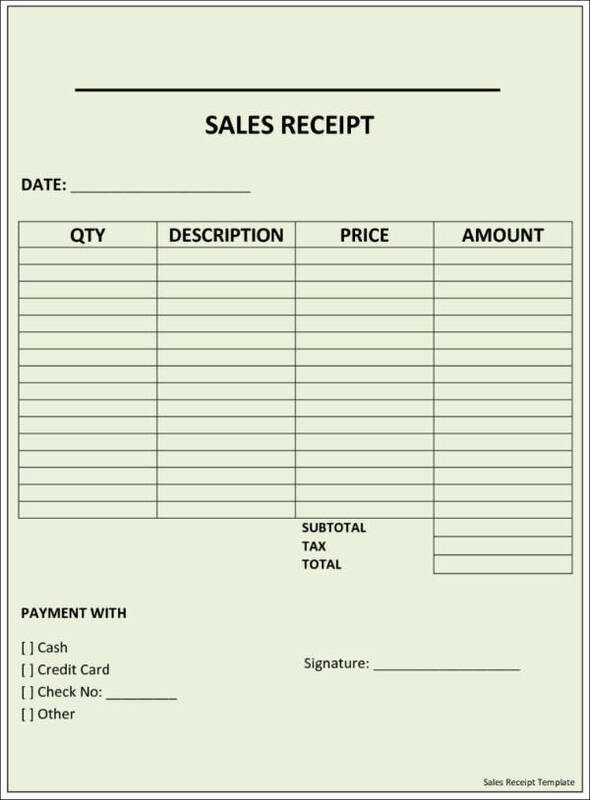 A sales receipt is a simple tool that showcases information about a particular purchase transaction. You can further protect your rights as a consumer, especially during returns of damaged items or possible exchanges, if you have a sales receipt on hand. Most legally operating stores and business establishments provide sales receipts to their customers. 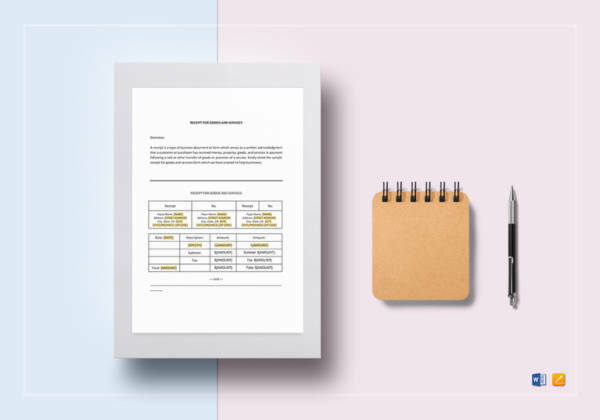 If you are a company who would like to develop a sales receipt, we suggest you refer to the sales receipt templates below so it can be easier for you to create an effective sales receipt document. The above mentioned information is very important to be placed in a sales receipt header as this part of the sales receipt can provide the following benefits and advantages. 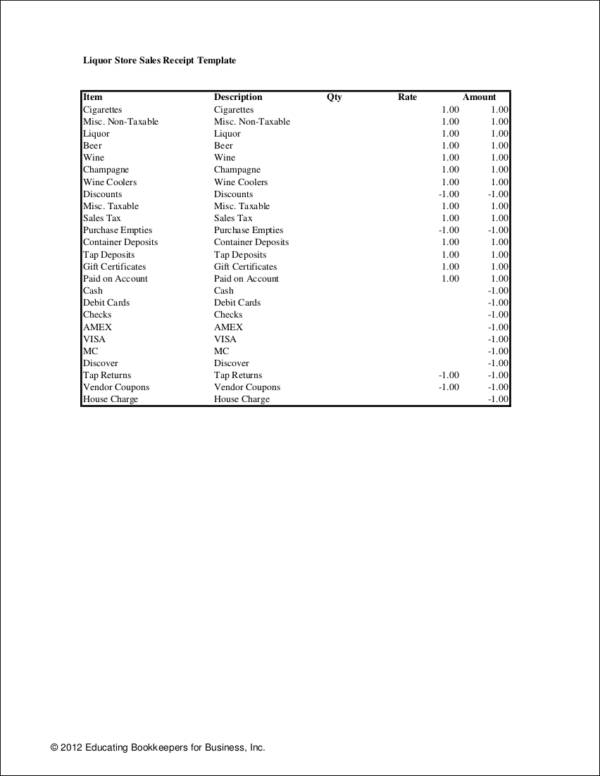 A printable receipt header can prove the authenticity of the sales receipt, especially if there are unique characteristics that can be found on it. 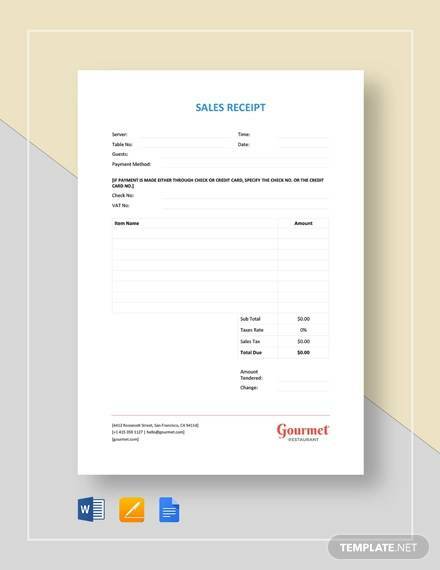 A sales receipt header can make it easier and faster for clients to contact the business if there are questions and inquiries that are needed to be addressed with regards to a specific purchase. 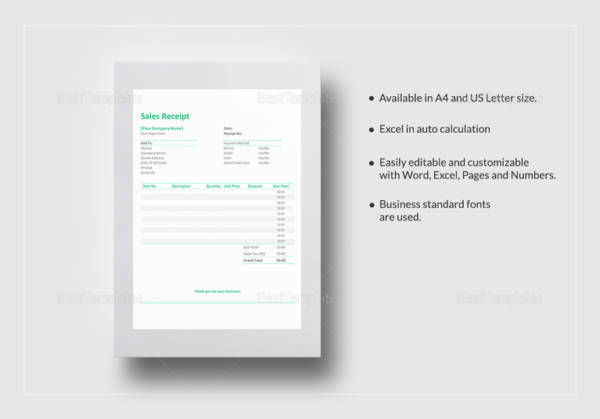 A sales receipt header can make the entire sales receipt look more professional and legitimate. This can help the business receipt present its brand identity even with the simplest usage of the specified tool. 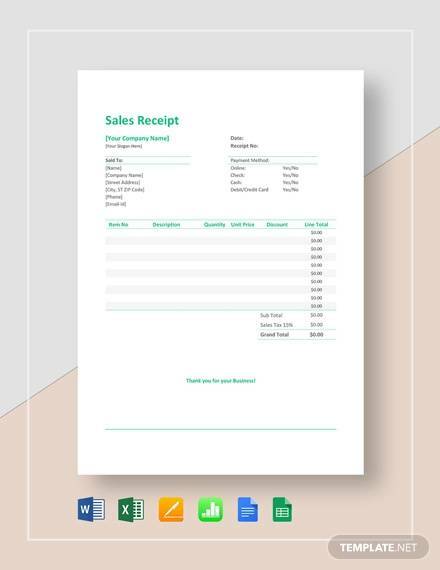 A sales receipt header can serve as an item of cohesion that can make the entire sales receipt look put together and presentable. A sales receipt header, through its unique code, can be used as evidence for legal transactions where the business is involved especially during discussions where tax advance payment receipt are involved. Make sure that you will incorporate organization within the entirety of the format of your sales receipt body. Being organized when presenting the information that you and the consumers need to know can help both parties identify details that are needed to be discussed. Proper organization of information can also help a sales receipt be an effective tool for business branding and excellence identification. Be specific with the information that you would like to have. Not all the details presented above are always seen in all sales receipts used by businesses from various professional industries and fields of expertise. 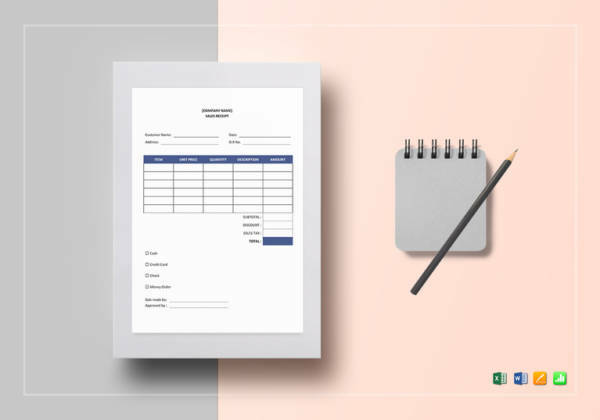 The content of your sales receipt form body should depend on the needs of the business and the kind of purchase transactions that are present in the daily operations of the company. Create a sales receipt body that can reflect the business as a credible and trustworthy establishment. Proper listing of purchase information, especially presenting the computation of legal additions to the base price of your products can help your business get the trust of current and target customers. If your blank sales receipt body contains all these details, you can ensure clients that you are very transparent when providing them the value of their money’s worth. Is There a Need for a Sales Receipt Footer? 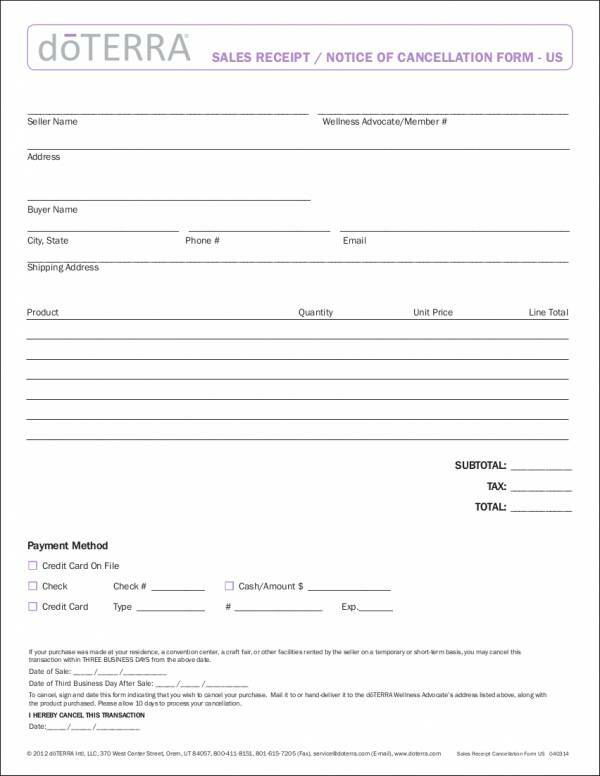 Aside from these items, a business establishment can add other details in the footer of their sales receipt, may it be a simple thank-you note for the customers or other items that they want to specify. They can have proper specifications of the items that they have bought. With this, they can check whether there are double charges or items that have not been punched. This will also allow them to have a document that can showcase the breakdown of the entire purchase transaction. Customers can easily contact the business establishment. There may be instances where customer feedback or further communication is necessary to be made. An example of this is when an item being purchased has not been placed in the cart of the customer but has been charged by the business. Another instance is when items and products have defects or damages and are needed to be returned. Clients and customers can ensure that there is a proper computation with regards to the amount that they have paid. Since a lot of stores can experience a lot of purchases within a particular time period, there may be instances where the number of items being bought by a customer can be miscalculated to make a receipt. Aside from these, price deductions and sale items may also not be charged accordingly. Through a sales receipt, customers can identify the prices of each item that contribute to the total amount of the purchase. People who have purchased items from a particular store can use sales receipts as evidence. For example, if there are lapses to the purchase being made or the customer wants to use or practice his/her rights for the purchase, a sales work receipt can make it easier for them to transact with the business. Aside from the benefits that a sales receipt can provide to customers and clients, it can also be helpful to the business and its undertakings as a corporate entity. Here are some of the ways on how a sales receipt can be advantageous to businesses. 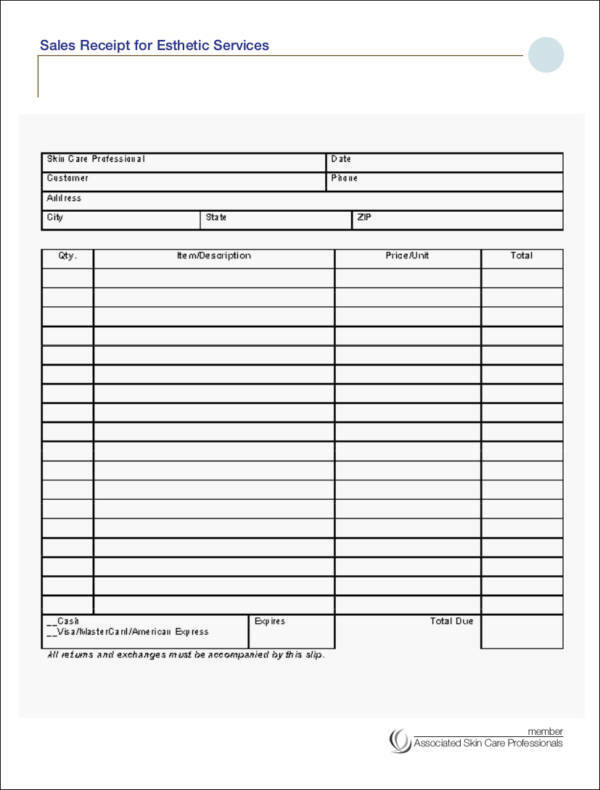 A sales receipt template can be helpful in the activities of the sales and accounting department. Since a sales receipt is considered to be a written payment acknowledgment, it will be easier for the specified departments to take note of the payments that are considered actual sales of the business. This can make the auditing processes of the business more precise. A sales receipt can be used by the business as a branding tool. All the items that are given by the company to their clients can be a helpful agent in terms of showcasing the brand identity of the business. 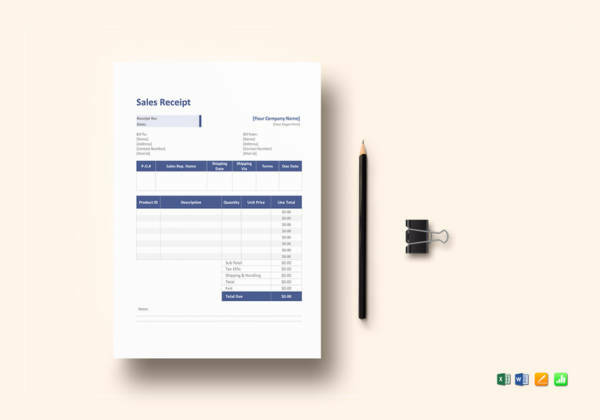 The format, layout, and overall structure of a sales company receipt can reflect the way on how a business would like to be viewed by customers. A sales receipt can be helpful in preventing misunderstandings between the customers and the business. As an actual physical evidence of purchase, businesses can have a realistic and objective basis in relevance to settling disputes with their clients. Unless falsification takes place, a sales receipt can be an effective way to specify particular claims. A sales receipt is highly beneficial as a legal evidence. Filing of taxes requires a business to present evidence of sale. This is the main reason why companies keep their sales receipts for a particular time period especially when editing made by outside sources are in the works. 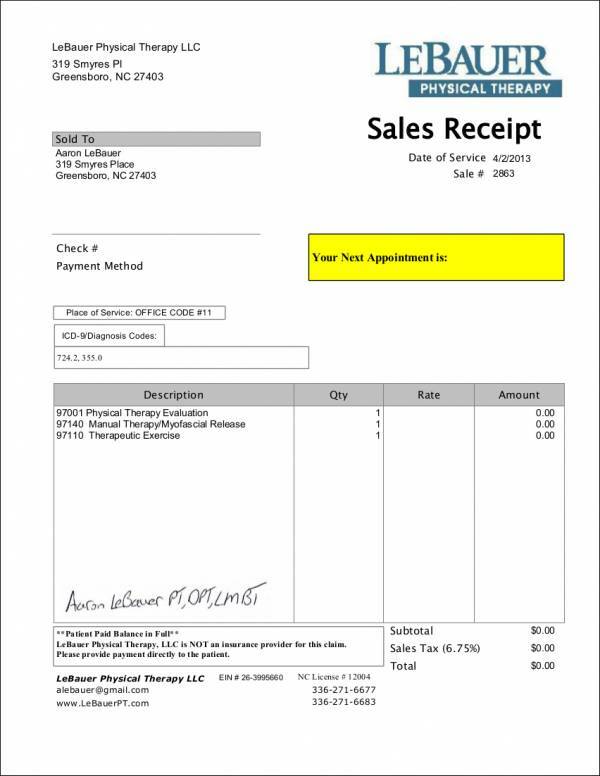 An effective and complete sales receipt is a great way to end a specific sales transaction, may it be used as an evidence for refund/reimbursement, as a proof of a particular purchase, or even just a basis for a transaction being made with another entity, it is very important for a sales receipt to be created in an efficient and practical manner. Some of the tips that can help you come up with a sales receipt that can achieve your sales objectives in relation to the matter of purchases are listed below. 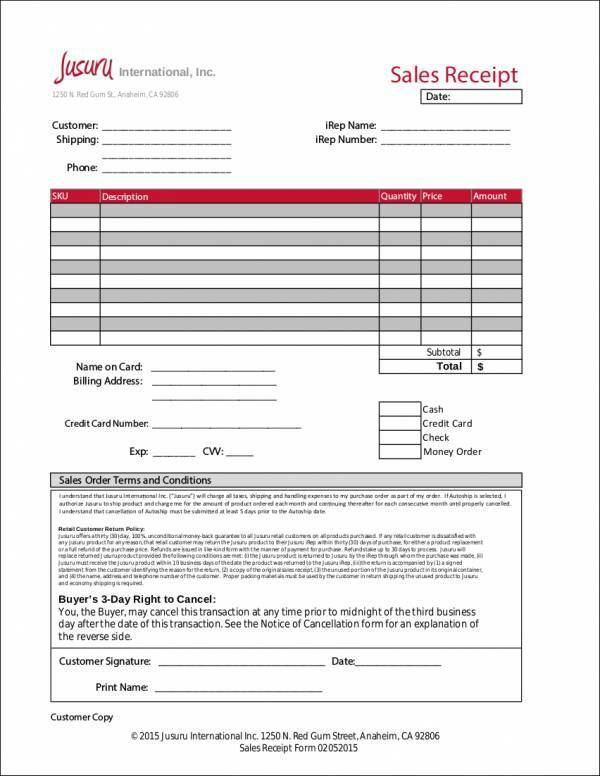 It will be helpful if you will use a template when creating the format of your sales receipt. Though there are no format restrictions in terms of developing the layout of your sales receipt, it will still be best if you can properly identify the information that you need to put together to make your sales receipt as effective as possible. Make sure to refer to sales receipt samples especially those that are used by your competitors. For one, this can help you identify industry standards that can affect both the content and format of your sales receipt. Also, it can help you assess the information that is necessary to be placed in your own sales receipt depending on their effect on the bookkeeping or recording of the business. Incorporate different branding items used by the business in your sales receipt example. Subtle items like logos, taglines, and quotations where the business is known for can be added to your sales receipt as a branding activity. Be specific and precise with the listing of information that you would like your sales receipt to have. This will help you maximize the usage of a sales receipt while minimizing or fully removing unnecessary information that can only make your sales receipt full but not highly usable. A sales receipt can be both beneficial to the business and its customers. If you want a sales receipt to be used accordingly, make sure that you will put time and effort into developing its structure. The samples that are available in this post are well put together, which makes them potential guides that can help you create your business sales receipt in a professional manner. What Is the Purpose of a Sales Receipt?